I never really knew what CC Filson was, until my buddy Will Pace at Circle 7 Outpost and Provisisions in Madison, Mississippi hooked me up with one of the Filson bags a few years back....as best as I can tell, I have the Heritage Sportsman Bag. It's like a small hand-bag/suitcase setup. 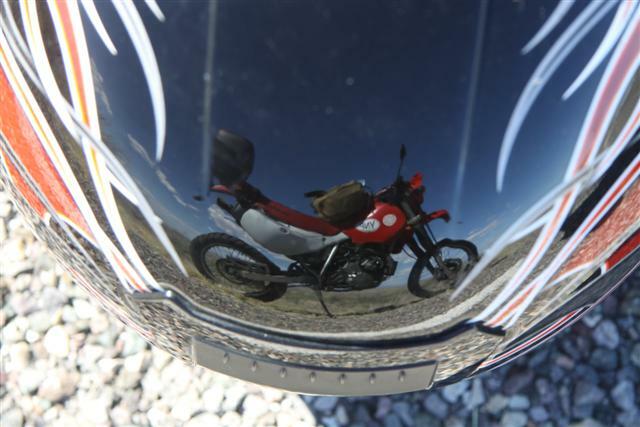 For whatever reason, I started using it on my motorcycle adventures to carry tools, clothes, camera gear, etc. The beauty of this bag is that it will not die. You pretty much can't hurt the bag, and I've been so rough on it you just can't imagine. I've traveled with this bag for years. 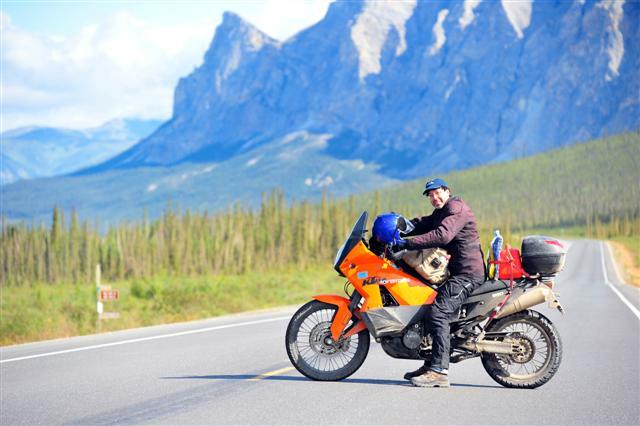 On the motorcycle, I've carried this bag over 30,000 miles, across 20 states, 8 countries, and 3 Canadian provinces. From the Arctic Ocean, to the Panama Canal. From California to Tennessee. From the Rockies to the Smokies, and all points in between. I've taken this Filson bag through Yellowstone, Yosemite, Rocky Mountain National Park, Glacier, Banff, Jasper, Kootenay, Mt Robson, Crater Lake, Vancouver, Victoria, Prudhoe Bay, Fairbanks, Anchorage, Seattle, Portland, SF. From the Arctic to the to the Caribbean. From the Pacific to the Caribbean. I've dropped it on the highway. Washed it in the washing machine. And dried it in the dryer. You can't hurt this thing. It's indestructible. I'm not exactly sure when I bought my first Filson bag....my best guess is the Summer of 2011, because I didn't have in it 2009 when I drove from San Diego to Cabo San Lucas and back on an XR650R. And I didn't have it in 2010 when I drove around Lake Michigan on an 1994 XL650R. But in August of 2011, when I drove from SF to Alaska and back, and then from SF to Denver, I had the bag. So probably I got it some time between November of 2010 and August of 2011, I guess. 2011 - SF to Hyder, Alaska and back, then to Denver, Colorado. 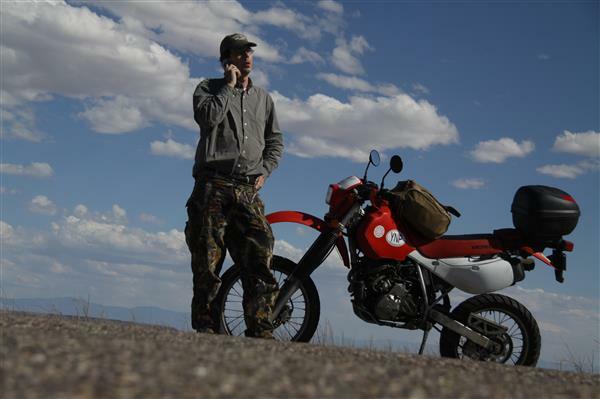 2012 - Denver to SF (2,150 miles). 2013 - SF to Denver. Moline, Illinois to Panama City, Panama. Jackson, MS to Denver, CO.
2014 - Denver to Deadhorse, Alaska and back. 10,500 miles over 28 days. Above: The Brooks Range on the Dalton Highway (Alaska Route 11). July 31, 2014. Above: Stopping at a closed camp above the Arctic Circle along the Dalton Highway to warm up. They are not open to the public, but Remus was freezing and worried about losing his hands or his feet. They let us warm up and even made us a pot of coffee. 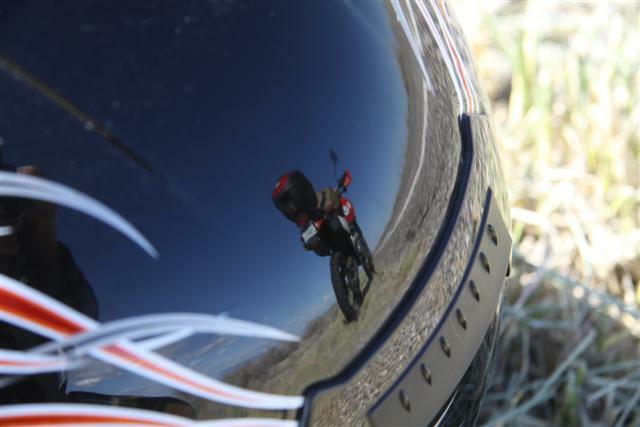 Above: Stopping along US Highway 50, the "Loneliest Road in America" in the Utah desert. 9/1/2011. Above: June 8, 2013. Traveling from South from Rio Dulce, Guatemala to Monte Verde, Honduras on Highway CA-13 in Guatemala. Above: June 11, 2013. KTM 990 Adventura Naranja on the playa at Lago Nicaragua. Above: June 14, 2013. KTM 990 Adventura Naranja in the jungles of Costa Rica near the Nicayo Gulf and Camaronal, Costa Rica. Above: May 20, 2013. Picking up the shiny new KTM 990 Adventure at Fun Mart Cycle in Davenport, Iowa. Above: May 21, 2013. I get stopped by the Illinois State Police for having too much fun. My ISP is Mountain Broadband. They announced that I was going to get a new IP address. Great. Thanks for that. Good morning. Due to a reconfiguration on our part of our system, we will need to change your static IP address. Sorry for the inconvenience, and we hope it will not cause you any problems. Please call us or email us if you have any issues. The new info will be listed below. The new IP is ready to go. I'm trying to determine what type of keyboard I have. Not clear where or when I got this thing, but I have some type of wireless keyboard made by Logitech. The keyboard has 2 AA batteries in it. It has roughly 79 keys, depending on how you count. It also has a small touchpad on the right side, about 3" x 2", I'd guess. If I look at the drivers in my Windows 7 laptop, it says "Logitech Unifying Receiver" and "Wireless 2.4 GHz Unifying Receiver" Model Number: Unavailable. So, my keyboard is apparently 2.4 GHz as opposed to Bluetooth, for what it's worth. Here....I'd wager money that what I have is the Logitech Touch K400 wireless keyboard. OK. Best Buy carries them and they cost $25.00. Bingo. So, after work on Tuesday, I went by Bass Pro Shops and picked up a new game-cam because my old one didn't take any pictures Monday night/Tuesday morning. The new one that I bought is a Stealth-cam Model STC-G30. 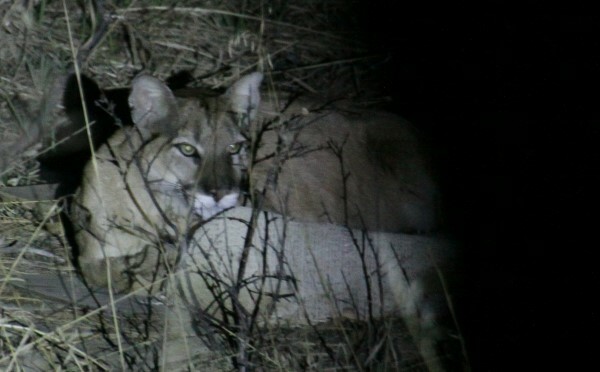 This is the 2nd night in a row I've had the new game cam set up for video. Last night, it snowed. Not sure how much longer the deer carcass will remain intact. Set up the new gamecam with a new 32GB SD memory card last night. Set it to "video" mode and walked away. Basically, it records 3 seconds of video when it senses movement. Pulled the card this morning, not knowing what to expect. I was blown away by the results. Enjoy. 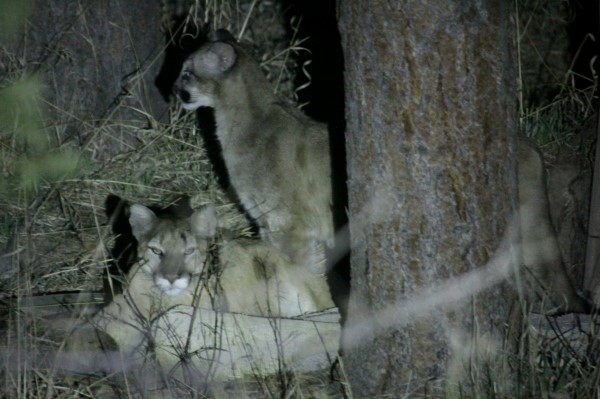 These are some photos we shot from Mark's deck last night of the mountain lion pride that has been feeding on a mule deer they killed in the yard. 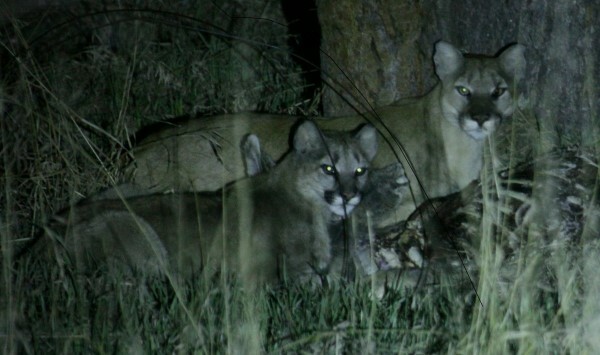 The pride appears to be a breeding pair of lions with 3 cubs/kittens. 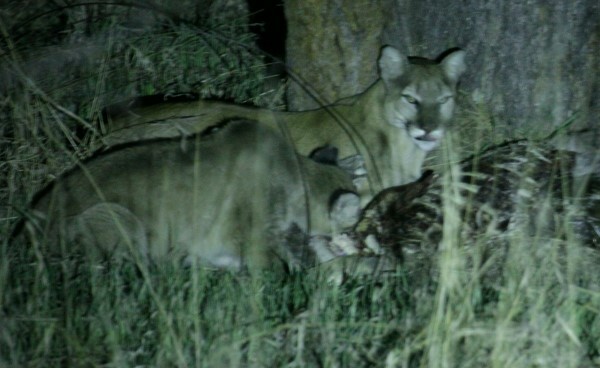 These photos were taken with a Canon EOS 50D and a 600mm f/4 IS USM Canon lens or a 400mm f/4-5.6 IS USM Canon lens. 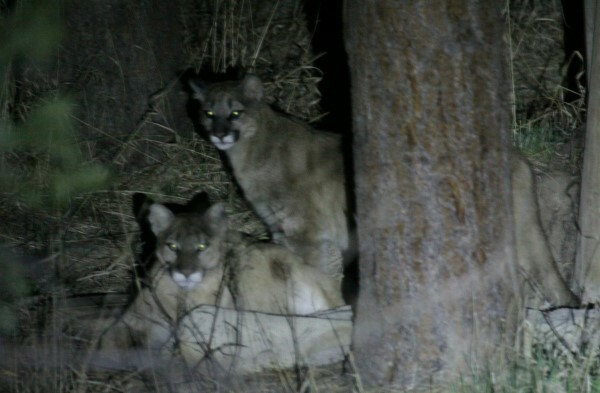 These mountain lions were first spotted Monday morning 3/30/15 at approx 4:00 a.m. 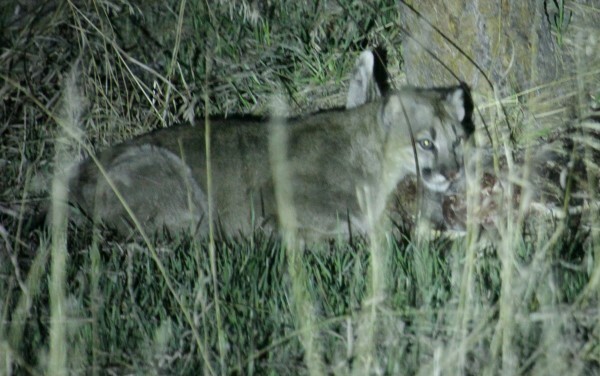 The mountain lion(s) killed a mule deer, which got all of the dogs and coyotes barking, and woke up much of Mark's family. 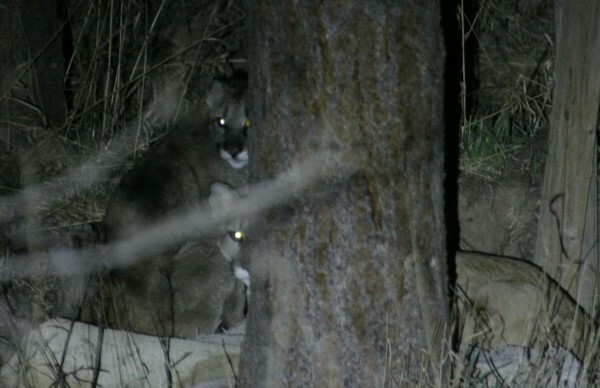 Mark texted me at 5:00 a.m. and said: "Mountain lion in backyard. Stay on road...come in front door. Don't spook him." 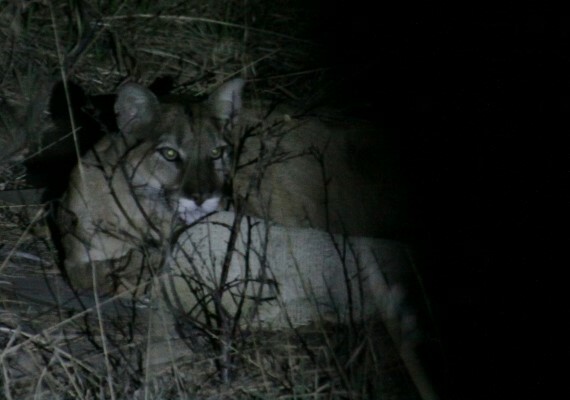 Here is the first decent picture we got of the lion on Monday morning 3/30/2015 at approximately 5:20 a.m.. Warning: Graphic photos of the mule deer carcass follow. You have been warned! 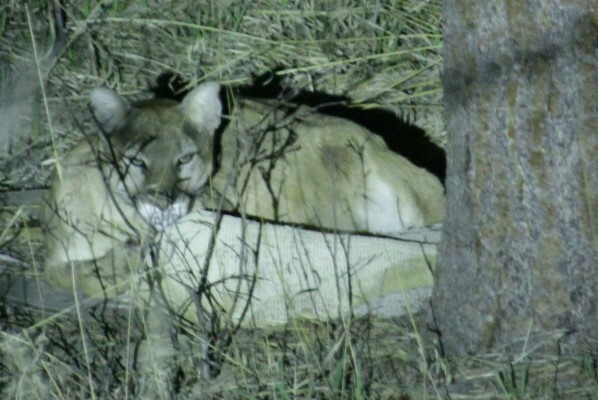 Continue reading "Mountain Lions - 3/31/2015"